WE FINANCE, REGARDLESS OF CREDIT!! EVERYONE IS APPROVED!! HABLAMOS ESPANOL!! ACEPTAMOS ITIN, MATRICULAS O PASAPORTES!! 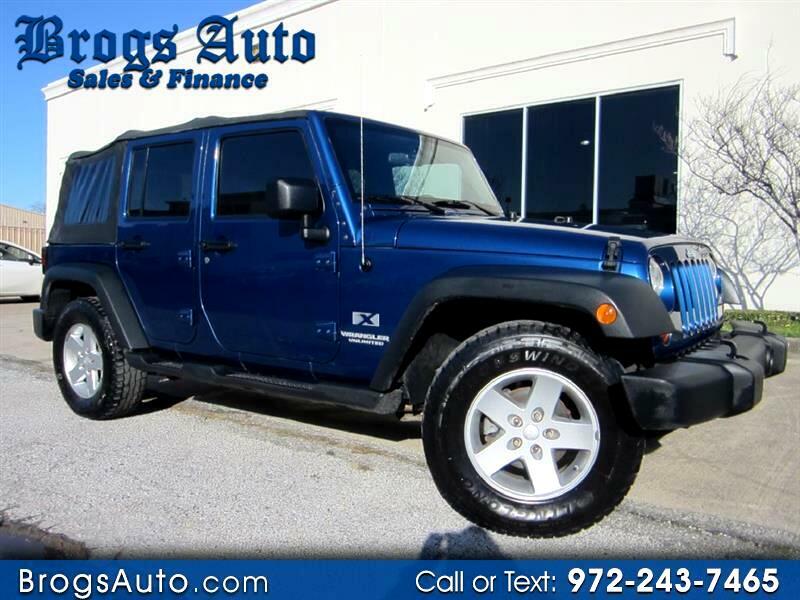 Impeccable 2009 Jeep Wrangler UNLIMITED X V6 3.8L SFI OHV 4X2, Autocheck and Carfax certified clean vehicle. BLUE exterior, cloth interior. SOFT TOP, RUNNING BOARDS, 18 INCH ALLOY WHEELS, This vehicle is equipped with AUTOMATIC 5-speed transmission, 4 wheel drive, automatic locking hubs, power tilt steering wheel, active belts, audio system with in-dash CD player, cold A/C, 2 door, driver and passenger airbag, soft top, tailgate type rear door, front and rear suspension stabilizer bars.... beautifully kept.. It drives and runs perfect. Oil service has been performed, new filters. See more pictures at www.brogsauto.com We take Visa, MasterCard, AMEX & Discover cards, bank drafts & cashier's checks also accepted, always taking trade-ins, all makes and years take the phone and call us now, visit Brogs Auto online at www.brogsauto.com to see more pictures of this vehicle or call us at 972-243-7465 / 469-237-5199 today to schedule your test drive. Available 4 years/unlimited miles extended warranty available!! !